Around this time of year, we all start thinking about the new year. 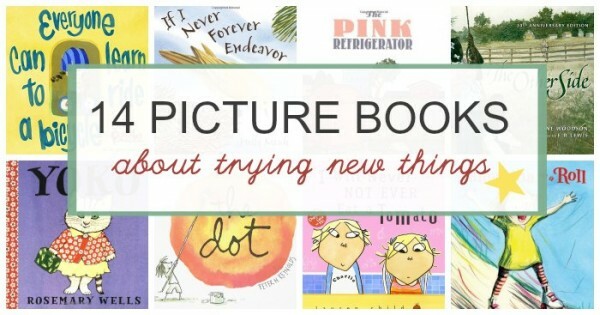 Even if you don’t “do New Year resolutions”, get into the spirit and read a few children’s picture books about trying new things. 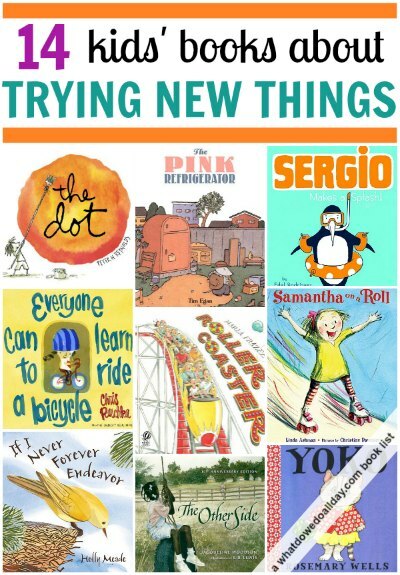 These picture books will get kids talking about the possibilities of spreading their wings, trying something new, like a new food, or taking up a new skill like swimming or riding a bike, or maybe even something as simple as meeting new friends. You can use these books as tools to help you talk about your kids’ fears or reluctance to plunge into the unknown, but all of them have one thing in common: they are just great stories. The Pink Refrigerator. I love Tim Egan’s series of early readers about Dodsworth’s adventures around the world but didn’t realize he had written a picture book about what prompted Dodsworth to start off on his trip. The badger (? mole? – I’m not really sure what kind of creature he is!) finds a mysterious pink refrigerator in a junk yard. Each day the note on the fridge sports a new suggestion, like “read more”, “make pictures”, or “play music”. Inside the fridge he finds the materials he needs: books, art supplies, a trumpet, etc. The final note, “keep exploring” prompts Dodsworth to leave his own note, “Went to find an ocean.” This is a great story about the willingness to be open to trying new things. Also available as an ebook. Everyone Can Learn to Ride a Bicycle. My husband needs to take note of the title of this book as he cannot yet ride a bike. He said he was going to learn alongside our older son, but he never did! Anyway. Raschka’s simple text and expressive illustrations take us on a journey of a girl just learning to ride a bike. Despite several — or a dozen — falls, she continues to pick herself up, dust herself off, and try again, and again, until…. success. Also available as an ebook. The Dot . Vashti insists she can’t draw but her art teacher encourages her to make just one dot and see what happens. Well, what happens is a marvelous adventure. My kids are also very reluctant artists, it is sometimes like pulling teeth to get them to experiment with art or craft projects. I like to read them this book to remind them not to discount the power of self-expression and to stop worrying about “standards of art”. Also available as an ebook. The Other Side is one of the most touching books about the payoff for taking risks and making new friends. A fence, both metaphorical and physical, defines the boundary between Annie’s white family and Clover’s African-American one. Clover’s mom has told her not to cross the fence because it is unsafe. Instead, Clover sits on the fence, watching the other girl play. Annie eventually approaches Clover and the two sides begin talking, a friendship is formed and the fence, finally crossed. There is no didacticism in Woodson’s writing as might make one cringe in a book like this. The final image of a line of girls sitting on the fence points to the idea that the very act of trying something new (in this case making a new friend despite the pressures not to) can lead to profound social change. I Will Never Not Ever Eat a Tomato. I am still holding out hope that this book will convince my just-about-5 year old to drop his picky eating ways. Lola is a super picky eater. Her big sister, Charlie, tries to “play a trick” and rename all the food items on Lola’s plate. Mashed potatoes become cloud fluff from Mt Fuji, carrots are orange twiglets from Jupiter, etc. The new edible items are so intriguing Lola can’t help but try them. But will she eat the “round red moonsquirter?” You’ll just have to read the book to find out. Yoko. This became a fast favorite of both boys when I brought it home from the library. Yoko take sushi to school for her lunch but when the other kids tease her the teacher decides to have an international day. Each child brings in a dish from another country for the class to try. Once again, however, the kids reject Yoko’s sushi, except for Timothy. Timothy is so hungry he even tries the sushi, which he find to be quite delicious thankyouverymuch and he and Yoko forge a new friendship over trying new things. A Kitten Tale is a cute story of four kittens who are anticipating their first snow. Three of them are nervous and ponder all the negative aspects of the cold, wet, white stuff, but the fourth, “can’t wait!” When snow finally comes, the fourth kitten rushes out and his joy over his first snow experience encourages the others to follow. Also available as an ebook. Chester’s Way . Chester and Wilson are best friends. They do everything together and everything the same. They are quite set in their ways. When the indomitable Lily moves into the neighborhood they initially look at her askance, but Lily’s bravery turns their heads and they find themselves trying new ways of doing things. Roller Coaster . Life is a bit like a roller coaster, yes? There is anticipation, excitement, dips, rises, plunges, climbs, twists, and turns. Some people aren’t brave enough and turn away, others are just tall enough to ride. The narrative focuses on a young girl taking her first roller coaster ride and all that comes with it. Illustrator Frazee is so gifted at depicting people and her character’s faces, as always, make the book truly enjoyable. Samantha on a Roll . This is a book about a girl who can’t wait to try something new! She longs to lace on her skates and hit the pavement, but her mom is not ready yet. Samantha decides to go for it anyway and experiences the first thrill of a new experience. Peep! : A Little Book About Taking a Leap is a great choices for preschoolers. The copy I checked out from the library sports a sticker that says “Great for Grads.” I don’t know about you, but when I graduated high school or college, a picture book was not really on my wish list, despite whatever pithy message it might hold (cynical creature that I am). But I digress. The tykes who will appreciate this book are the under 5s. Peep is a small chick who is nervous about taking a leap off a ledge, but he does it! Hooray! Only… here’s another ledge. My Brave Year of Firsts: Tries, Sighs, and High Fives. I should maybe (or maybe not) admit that Curtis’ books are not usually on my list of must-reads. This one fits our theme today so perfectly, however, that I can’t help but include it. Curtis’ signature rhyming style narrates a list of firsts, from pets to going to school to getting caught in a lie. The overriding narrative is that growing up means trying a lot of new things — having a lot of “firsts”. Do your kids like to try new things? Or are they more reticent when it comes to the unknown? What books would you like to add to the list? I so, so love this list! The Charlie and Lola book was one of our favorite books that made us laugh and laugh. So many wonderful books on your list that we have loved! Nice list! These will pump me up for my New Years resolution writing coming up 🙂 Thanks! Thanks, Celeste. I hope the books inspire you and your kids. We love Samantha on a Roll and Yoko. I want to check out Sergio Makes A Splash and A Kitten Tale. Thanks. Ugh, the NYPL doesn’t have Sergio Makes A Splash at all and has Sergio Saves the Game available for in-library use only. I hate that! How annoying! I always think, “but this is NY! We should have the book.” Also I’m a big baby when the NYPL has it but the BPL doesn’t because I never want to go into Manhattan just for a book. Great list! Don’t be Afraid to Drop by Julia Cook is another great book about taking risks. That one is new to me. Thanks for the suggestion.